Pan Seared Scallops with Bacon Cream Sauce are cooked perfectly, then served up on a bed of that dreamy bacon-packed sauce… If you are looking to impress anyone with your skills in the kitchen, this is the one dish that’ll steal their hearts every single time. This is how you open a date-night dinner to remember. For Valentine’s Day this year, I wanted to give you all a recipe that will both be the perfect way to show someone how much you love them, and also show yourself how much you love YOU. 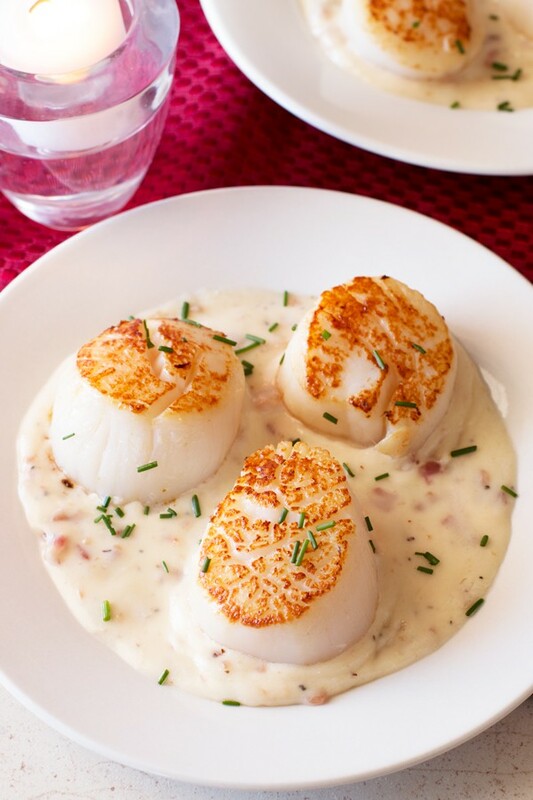 Because there’s no other way to say “I love you” than perfectly seared scallops nestled in bacon cream sauce. If ever there was a recipe to seal the deal on date night, this one is it. In a medium skillet, cook chopped bacon over medium-high heat until crisp. Remove the bacon with a slotted spoon to a paper towel-lined plate to drain. Add butter, cream, and Parmesan to the skillet with the bacon grease. Reduce the sauce over medium heat by half. Stir in the cooked bacon. Season with salt and pepper to taste. Keep warm over low heat. In a separate skillet, heat 1/2 tsp olive oil over medium-high heat. Season scallops with salt and pepper. Once the pan is hot (make sure it's really hot! ), add the scallops to the pan. Sear until golden brown on one side, approximately 1 minute, and turn over. Sear on the other side for 1 minute until golden brown. Remove to a paper towel-lined plate to drain. Serve the scallops over a layer of bacon cream sauce. Garnish with chives. 0 Response to "Pan Seared Scallops with Bacon Cream Sauce"